Over the weekend the conditions could not have been more perfect. On Saturday we had the 6-mile course race – in glassy conditions. And on Sunday, the winds picked up for the double downwinder event. This has always been one of my favorite events to come to, because it is such a fun place to hang out and play around. 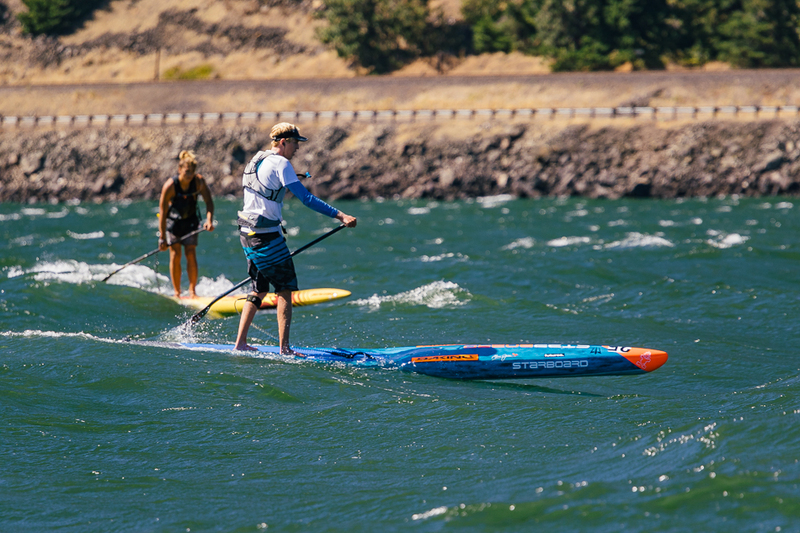 This year before the event – Zane and I got to Foil on the river. But that’s another story!! 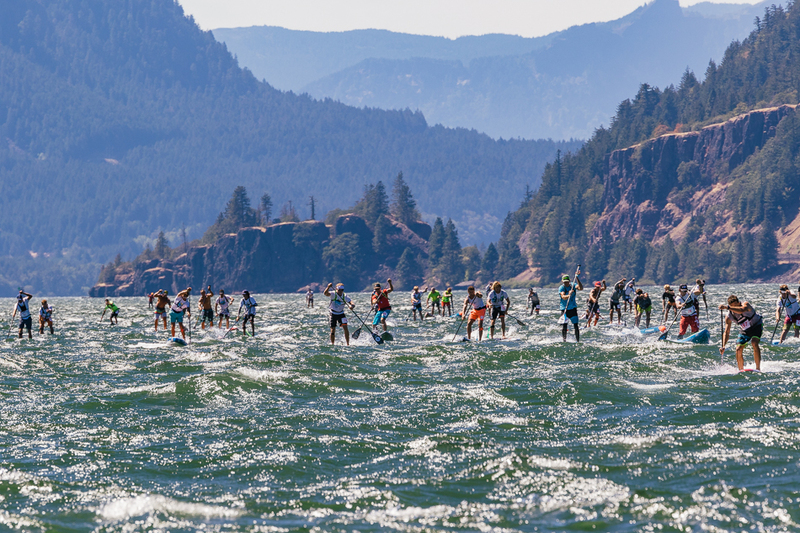 This course race ran first on Saturday – and without the normal windy conditions – the 100° temperatures were super brutal. The women and men had separate starts, which made it very fair and clean racing. The men started at 2 o’clock and we were all ready and anxious for the action to begin. We had some of the best racers in town for this race and everyone was here for the same reason. So you can imagine the intensity of 60 guys on a start line. We all lined up in waist deep water, the red flag went up – meaning we had two minutes to the start. When the green flag went up we had one minute and I was ready for battle. 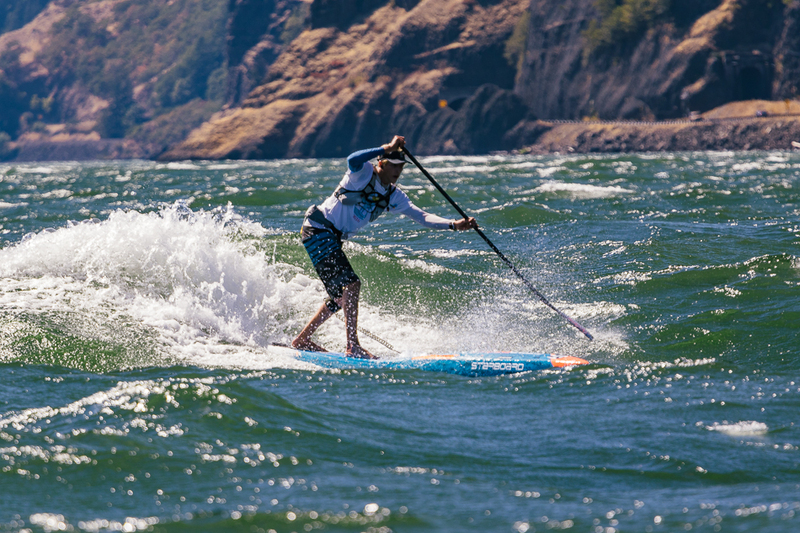 The horn blew and I quickly jumped on my board – took a few strokes on my knees to get in some cleaner water. And off to the first buoy. 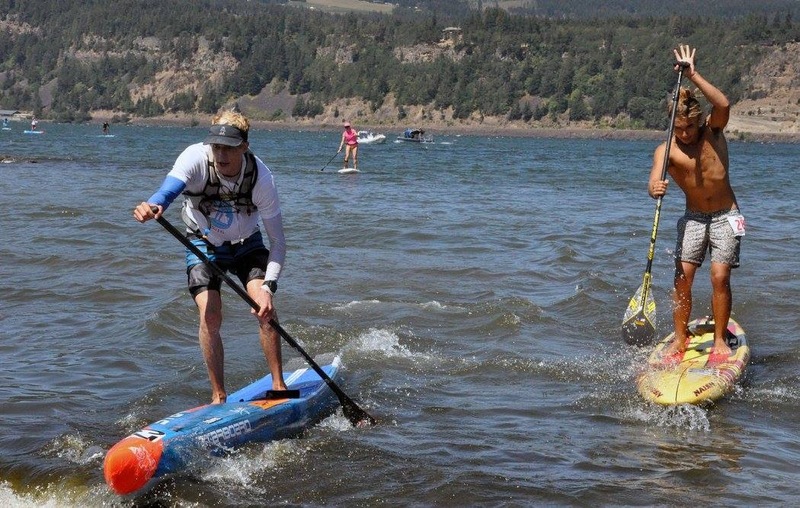 I turned the first buoy in the top 10 – and that is not where I wanted to be. So I pushed hard during that first lap to jump into that top five spot. This year they changed up the course race by adding a “Super Lap” into the mix. We’ve had this in a few events this year and it adds some strategy to the race. In previous years, the head of the snake would almost catch up to the tail (called a draft train). Whereas this year with the Super Lap – it really mixes everything up and stops everyone from drafting the whole entire race. So what is a Super Lap? 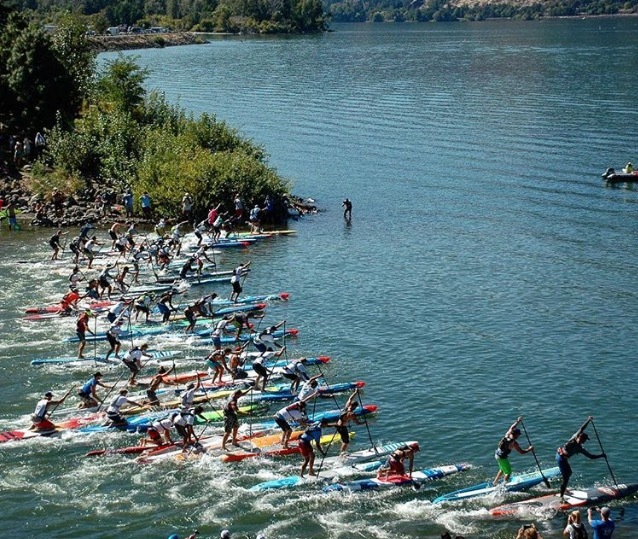 Each individual paddler gets to take a shortcut on one lap of their choice during the course race (diagram below from SUPracer.com). I had no plan on which lap to take the shortcut, but was definitely ready at any moment during the race. The first three laps I stayed in that fourth place position trying to conserve energy for the lasts two laps. 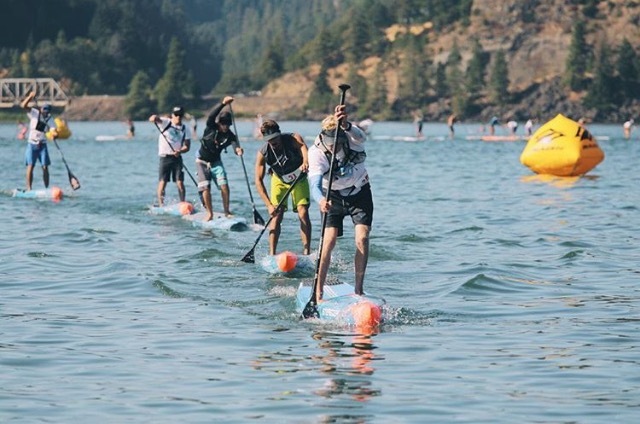 On the third lap I was following Michael Booth and Leonardo Nika and they turned the buoy first to head out for the full lap and I saw an opportunity so I took my chance with the shortcut and everyone followed me, which put Michael and Leo way behind me. They still had their super lap saved up, so I made sure to push as hard as I could, so that they would not be in front of me. 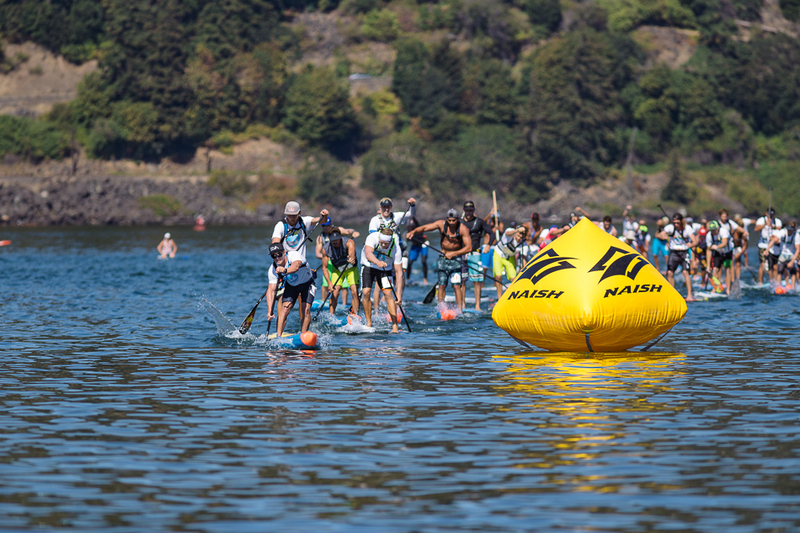 As I turned the inside buoy heading out for the full lap I saw them both coming towards the shortcut and I put my head down, so when I turned the buoy for the last lap, we were all together. The last lap I made sure to control that first place spot and keep the hammer down. I was able to hold everyone off and not let anyone get on the inside of me for the last two buoy turns. 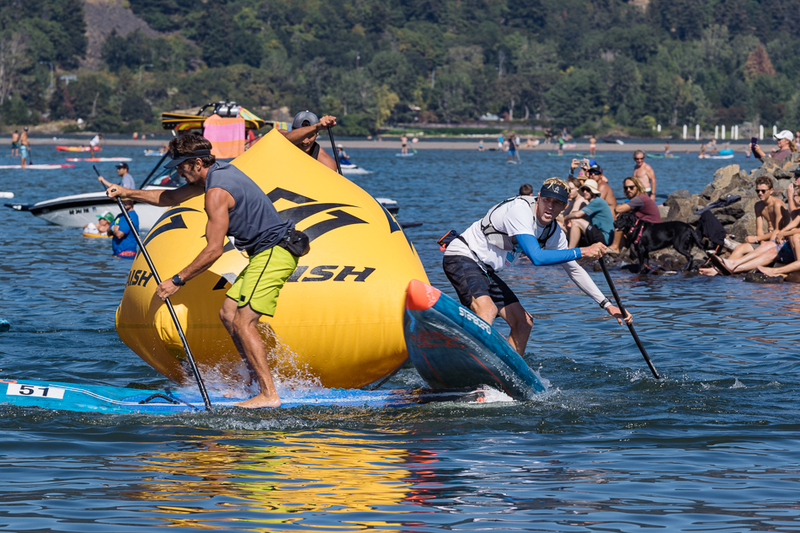 I sprinted to the last left turn and right when I turned the buoy there were little bumps, so I choked up on my paddle and went into beast mode for the final sprint into the beach. I was super stoked to run up in first, because this was the race I was most nervous for, compared to downwind, which I do most everyday. I gave myself a pat on the back and got a healthy meal into me, combined with a good sleep, so that I was well rested for the double downwinder the next day. Sunday morning the wind was already up and I was like a little boy in a candy shop. I was so excited to race with all the boys and show them what I like to do. The first start was at 12 o’clock and the wind was not cranking, but it was enough to make some good bumps. When the horn blew I jumped and started immediately looking for bumps to catch. Within 10 or 15 minutes the bumps started to line up and I started to find my rhythm. The first run I battled it out with Matt Nottage for the first half of the race, until I got to the hatchery and the bumps were sticking up and I went into my happy place. As I got close to the finish, I had a healthy lead on the pack of guys. I started to get into a nice slow rhythm, considering that we had one more 8 mile downwind race to go. I got a weird feeling though and looked up to my left and noticed Bernd Roediger flying downwind. So I shifted into a higher gear and put my head down until the finish line. I was able to squeeze in front of him by a few seconds. I quickly got some water and some shade so that I was well rested for the final race of the weekend. My girlfriend Anaé drove me back up to the starting line and I got a perfect spot on the line. The wind seemed to have picked up a little bit more and I was ready for one more race and to have a clean sweep. The horn blew and I went back into my race mode and hunted down ever bump I saw. Mo Freitas, Bernd and I all quickly jumped into the front and it was the same top three from the first race. We all tried to pull away for each other, but we all wanted that same top finishing spot. So instead of killing myself trying to pull away, I just surfed and connected every bump. I knew if we were close at the 3/4 mark I could pull away in the flat water. So I just had fun and was surfing my brains out. I took a different line from the first run and stayed with Bernd and it was way quicker to the beach. As the bumps got small I got more energy to push to the finish line. I told myself – there is no pain – and started hammering to the beach. Next thing you know, I had a few board lengths ahead and ran up the beach with a clean sweep of the whole weekend. Also a big Mahalo to all the event organizers and all the volunteers. Incredible Event – As Always! !